Total nonfarm payroll employment increased by 160,000 in April, and the unemployment rate was unchanged at 5.0 percent. Employment increased in professional and business services, health care, and financial activities. Job losses continued in mining. Texas Will Survive the Oil Glut, Thank You. Screwing with Putin by killing the profits of the petro-state does not seriously threaten Texas, according to this Federal Reserve Report from the Dallas Branch. The vice president of the FRB-D says that there are large “industry clusters” around the state where the economy is stable. She says industries with high-paying jobs – like government, technology, construction, biomedical and defense – may not grow very quickly, but they don’t tend to lose jobs. “(Researchers) look at the question of why cities tend to grow faster,” she says. “They tend to grow faster because firms tend to group into industries and specialize, so certain regions are specialized in certain industries. This increases productivity growth. It raises wages for workers and it has a lot of benefits on growth. Orrenius says the report shows a surprising diversification in industry in places like San Antonio, one trend that mimics the nation as a whole. The Report says that Austin bounced back from the Recession paced by its large and fast-growing high-tech sector. Austin currently ranks first on The Kauffman Startup Index. The Midland-Odessa Region will contract during the Glut, but that region has faced this before, many times, so it is “mature” in its handling of the situation. 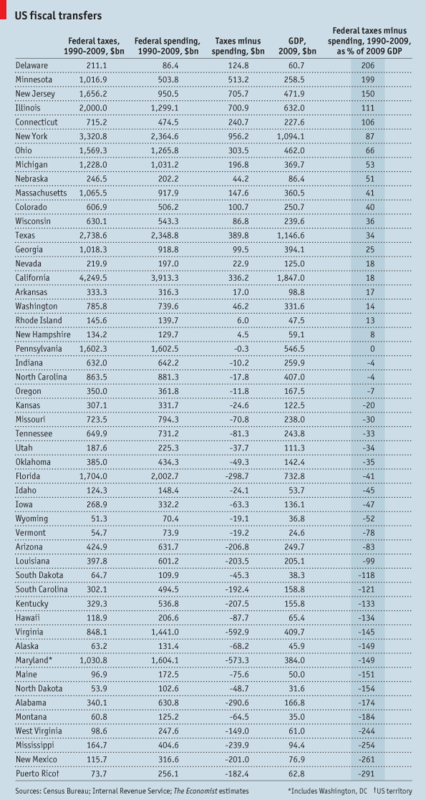 Fix and PL commenters are quick to allege that R states are “donees” and D states are “donors”. The reality eludes them. But what is the reality? In the map above, the deepest green states are the biggest donors and the deepest red states are the biggest donees. The average state should be light green, that is, a small donor, to cover spending outside the USA. We should look at the average states, the light green ones, like Texas, last. We can quickly deal with some of the red states. MD and VA house much of the federal bureaucracy. They are understandably donees. NM and AK have huge native American and national park and national forest burdens. They are understandably donees. Notice, btw, that of those first four, only one is reliably Republican. That always falls on deaf ears at PL. NJ, an industrialized state with plenty of manufacturing and commerce and limited support from AG subsidies or military bases or national parks or Indian reservations, is an understandable big donor. I have more trouble understanding IL’s situation. Like TX, it is big in industry and agriculture. IL should be light green, as far as I can see. Why is it such a big donor? Why is WVa such a big donee? If I had to guess, I would think it was purely the legacy of Robert Byrd, but that is cynical, no? Why is FL a net donee? Indians and parks? Could be the Everglades and Key West and the military are enough to explain it, coupled with AG subsidies. Or are they counting where the social security checks are going? I am curious as to y’all’s deep thoughts, this not being either The Fix or PL. Are we out of the woods with Greece? No. Greece intends to hold elections in the next few months, and there is nothing preventing a new government from undoing all of the austerity measures imposed for this deal. The Chicago Fed released its National Activity Index this morning. It came in at .22, which indicates the economy is growing faster than its historical trend. An index value of zero means the economy is growing at its historical trend. Employment and Production were large positive components, while Consumption and Housing were negative components. December was revised higher as well. The Home Despot reported better than expected earnings this morning, which should be another positive indicator for housing and the economy. Macy’s also reported a strong holiday selling season. Economic data on tap this week: Existing Home Sales on Wed, Initial Jobless Claims on Thurs, New Home Sales on Fri. Global equity markets are weaker this morning as European leaders delay a vote on the Greek bailout until 2/20. The finance leaders were able to squeeze some more concessions from political leaders, but there are still differences over surveillance and control. Separately, Moody’s threatened a downgrade of the global banking sector. Bonds and mortgage backed securities are slightly lower as well. GM posted a record profit! I am sure tomorrow’s editorial pages will be filled with columns praising the auto bailout and using this earnings announcement as justification. Well, if you repudiate your debt and get rid of all that pesky interest, you had better post record earnings. GM’s numbers were still below estimates and the stock is down a couple of percent pre-open. As an aside, Chrysler has to issue senior secured debt at 8%. That is a usurious rate for senior secured debt. See, that is what happens when you re-order the priority of creditors. Investors remember. Economic data this morning: Producer Price Index more or less in line with expectations, running at 4.1% annually. Initial Jobless Claims continue to fall, coming in at 348k vs 365k expected. We are more or less back in the historical “normal” range. Housing starts came in at 699k, above expectations, but still very low. 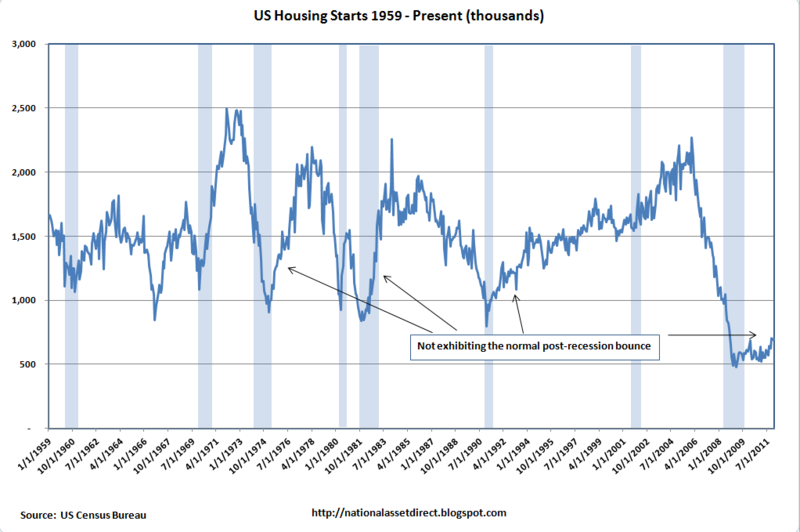 In prior recessions, housing starts bottomed at 750k – 850k. The last time we were above 1 million units was June of 2008. 1.5 million is normal. The lack of residential construction has been the achilles heel of the recovery so far. The minutes of the FOMC meeting were released yesterday. They really don’t add anything to what was said in the press conference after the rate decision. The minutes don’t really address the question most had regarding the recent good economic data. “Many participants noted some indicators bearing on the economy’s recent performance had shown greater-than-expected improvement, but a number noted less favorable data…” The tone of the minutes was that the economy was improving, albeit slowly, and there is no reason to take our foot off the gas for the moment. Maybe the Fed believes the Greek negotiations are simply a big kabuki dance and that a default is unavoidable. RealtyTrac has released its U.S. Foreclosure Market Report for January 2012. Key Quote: “Although overall foreclosure activity was down from a year ago for the 16th straight month in January, we continue to see signs on a local and regional level that the frozen-up foreclosure process is beginning to thaw.” They predict increasing foreclosures in the coming months especially given the settlements in early Feb between the nation’s largest lenders and 49 state attorney generals. Clearing out the shadow inventory of foreclosed homes is a necessary but not sufficient condition for a recovery in house prices. Markets are higher this morning on statements from the Bank of China regarding support for the European bailout and its willingness to help. Concerns about an eventual Greek deal are offsetting some of these gains. Bonds and mortgage backed securities are flat. Mortgage Loan Delinquencies are increasing again, according to TransUnion. 64% of MSAs reported increases, which was flat compared to Q3, but much higher than Q2. There are seasonal factors at work here, and the continuing decline in real estate prices are certainly playing a part, but that is not an encouraging data point economically. As if the foreclosure pipeline wasn’t big enough already. Not that the markets really care, but it looks like we have a payroll tax deal. The Empire State Manufacturing Index came in at stronger than expected. This is a touchy-feely indicator of general business conditions put out by the New York Fed. This index is notoriously volatile, so big moves should be taken with a grain of salt, but it shows that the expansion is gaining momentum in New York State. Separately, industrial production was flat and capacity utilization unexpectedly fell. The National Association of Home Builders will release their market index at 10:00 am. Residential construction has been the missing piece of the recovery, but has been showing signs of life lately. Earnings reports from the homebuilders have been constructive. The FOMC minutes will be released this afternoon. I am very curious to see why the Fed is behaving as if the economy is rolling over, while the data suggest otherwise. Last, Ezra Klein at the Washington Post has a story on how the World Cup affects trading. I can attest to this personally, having been a block trader at Bear Stearns in London for a number of years. When England was playing a match, the phones would stop ringing and everyone had their backs to their screens, watching the match. You could actually see major stocks like British Petroleum and Vodafone stop trading. As an American, it was strange to watch. 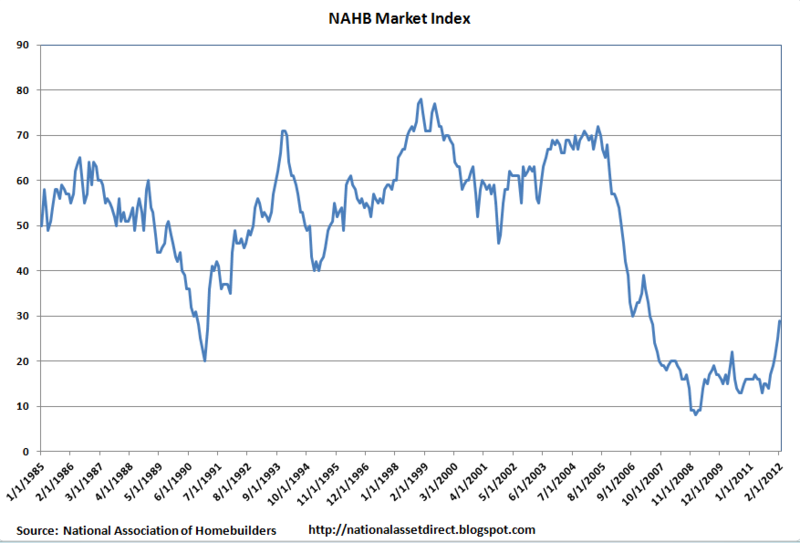 The National Association of Homebuilders released their market index at 10:00 am. The index came in better than expected and it looks like conditions are improving at an accelerating rate.